Happy Monday everyone! I hope you enjoyed your weekend. I apologise, as I know this is probably the last thing you want to hear on a Monday morning, but today I want to talk about taxes – specifically the import and VAT that we, as importers, need to pay on goods bought from outside the EU (i.e. from China, USA, India etc.). And actually it’s this dislike and general avoidance of the subject that has led me to write this post… as I recently received an email from someone distraught about an order they’ve placed because of the VAT and import duty. Initially they had expected to make a healthy profit reselling the product on eBay, but they had miscalculated the import taxes! That goes completely against one of my main rules when importing – always do all of your calculations BEFORE placing an order, so that you know exactly what it’s going to cost you and how much profit you stand to make. So today I want to share a simple and straightforward guide to calculating import taxes. Without further ado, let’s get to it! First of all, exactly what taxes do you have to pay on goods imported from outside the EU? But when we discuss imports, 90% of the time it’s referring to China, and that obviously means there are import taxes to be paid, which are – VAT (value added tax) and import duty. VAT is a set amount, currently 20%, whereas import duty ranges from 0% (duty-free) to 15%, depending on the product. The exact amount is calculated using the product’s tariff code, which is a special number assigned to specific products. And by specific products I don’t mean – doll, clothes etc. I mean really specific, i.e. pyjamas of knitted cotton for boys under 14. The total shipping cost (including insurance). As you can see, everything has been worked out perfectly for me! I’m given my total customs value of £2,400, I’m given the amounts I need to pay for both import duty and VAT separately, as well as the total amount of import taxes due, and my final landed cost. And at the bottom, under “calculation and compliance notes”, I can find out exactly what rate was used for the calculation. In this case the product was VAT exempt (quite rare) and had an import duty rate of 12%. This product had more typical import taxes, with VAT at 20% and import duty at 6.5%. 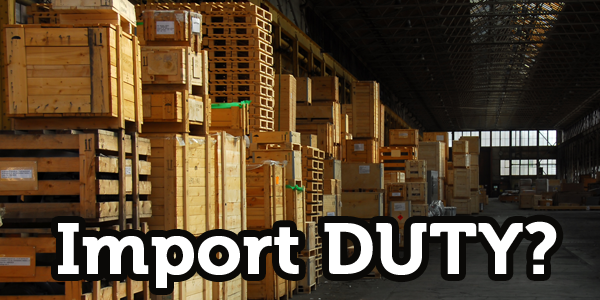 BUT while dutycalculator.com is a terrific site, and one that I recommend to many of my readers, I still really believe that you need to be able to understand and calculate import taxes for yourself! To help you understand why, I want to quickly go back to the person I mentioned at the beginning of this post, who had miscalculated the import taxes on their order. And yes, the person in question (who I’ll now refer to as Bob, to keep things simple) is more than happy for me to share his story to try and help others avoid the same mistake. Bob was ordering 200 units of a product for £8 each, with £400 on top for shipping and insurance. Then, going back to the quote he received from his supplier, Bob then worked out his final landed cost, and this is where he made his big mistakes! Firstly, he only used the value of the goods, not including freight and insurance, and secondly, he used a rough figure of 25% for VAT and import duty. So a total landed cost of £2,400 or £12 per item. BUT, let’s redo the calculations the right way and see what difference that makes. I’m going to do this step by step, so that you can apply the exact same method for your own orders. 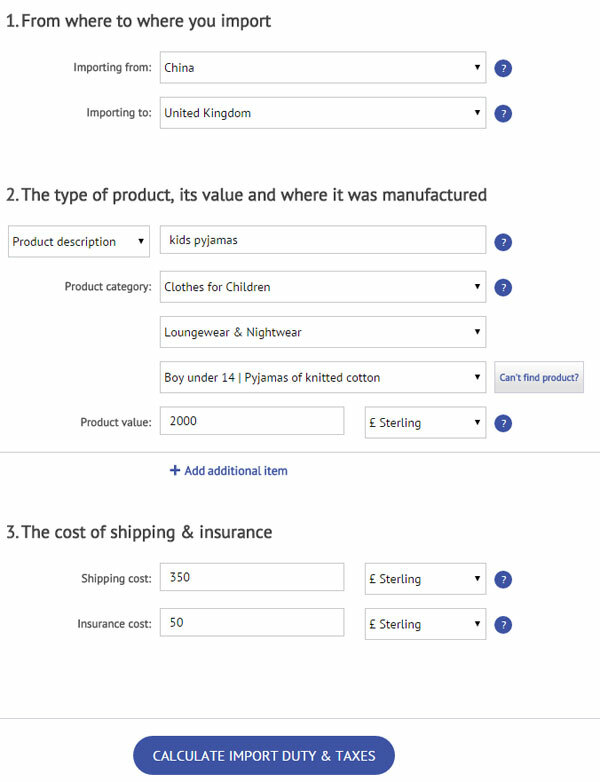 Step 1 – Calculate the total customs value (product, shipping and insurance) of your order. In this example that is £2,000. Step 2 – Calculate the import duty. Step 3 – Calculate the VAT. *IMPORTANT* VAT is paid on the total customs value PLUS the import duty paid. So that means £2,300 x 20% = £460 VAT. 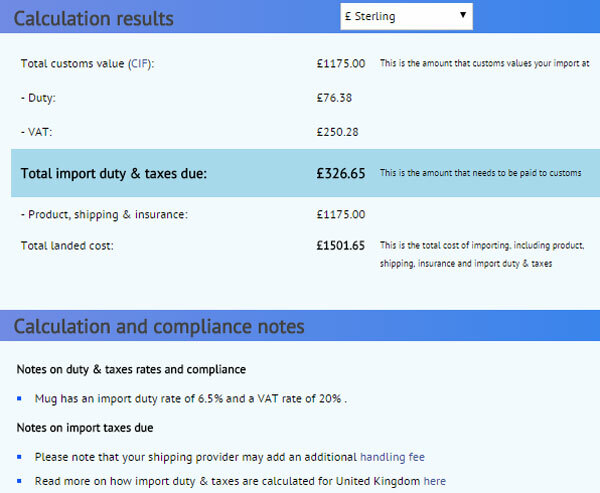 Step 4 – Add the total amount of import tax to your order amount to get your final landed cost. And just like that the profit per item dropped from £2.52 to a measly £0.72 and from an ROI of over 20% to just above 5%! A 4x difference in profit, all from miscalculating the import taxes. I hope you can now appreciate why I always stress doing exact calculations BEFORE you place an order, as afterwards it’s too late to change anything! Really there’s no excuse not to get this done, when you have sites like dutycalculator.com to do all the work for you. If for whatever reason you can’t/don’t want to use that site, then that’s fine – you can go straight to the source and find out the tariff codes for any product using the Trade Tariff tool here. Or better yet, if you’re using a freight forwarder for your shipment, speak to them! You’d be surprised at just how knowledgeable a good freight forwarder is on all things import related. In fact I’ve actually saved a lot of money over the years following the advice of mine. I’m talking about simple things like using a different material for your product or adding something to the package that actually reduces the import duty due. However you decide to go about it, please always make sure that you do full calculations for every order you place – otherwise you can get a nasty surprise when your goods arrive and it’s time to pay the bill! And that’s about it for today’s post. My apologies to those of you who didn’t want to think about taxes on a Monday, but I hope this has prompted at least a few people in the midst of an order to stop and calculate things carefully. I am new to business and have been working as a Remote Project Manager on Upwork. 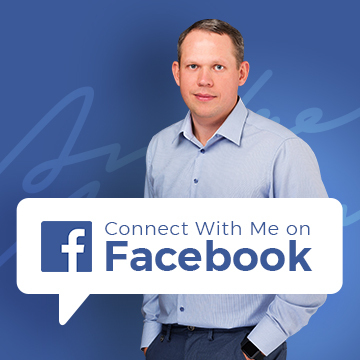 I am self-employed and have a registered Ltd. company. It is not VAT registered. Now as I have decided to pay full attention to selling on Amazon, should I register it for VAT or it should be after a certain turnover? No, you should not register for VAT now if you’re based in the UK and plan on selling on Amazon UK. I have been working through your blogs Tonight I started researching products to import from China. 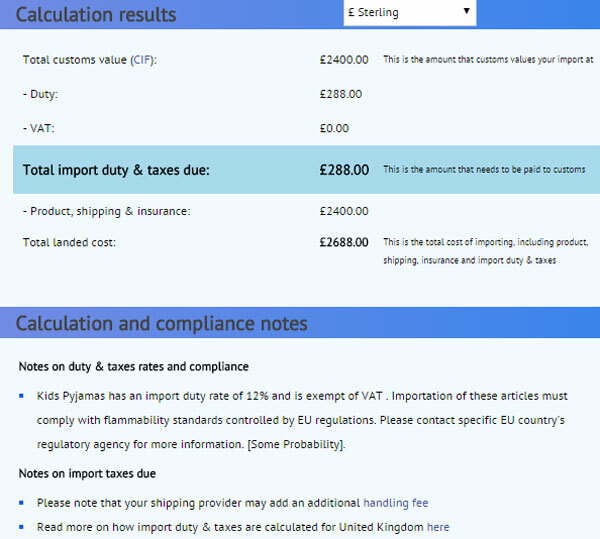 One problem I have come across is that the import duty calculator only let’s you have 1 go. Now I need to pay. I really wanted to do more research before buying subscriptions. 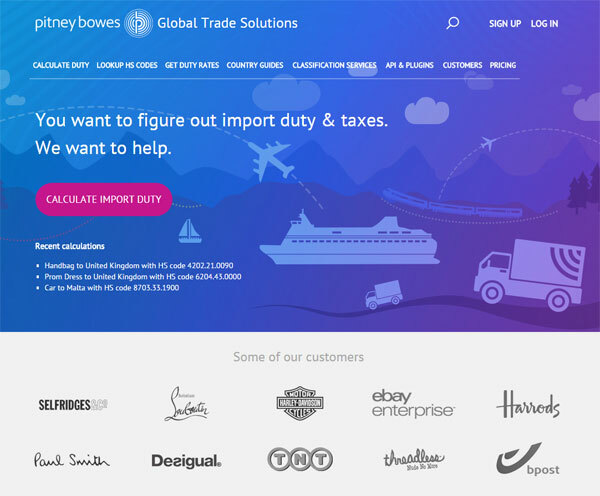 Do you know of any other import duty calculators? And simply do calculations on your own. Hi Andrew, great post mate, very informative. 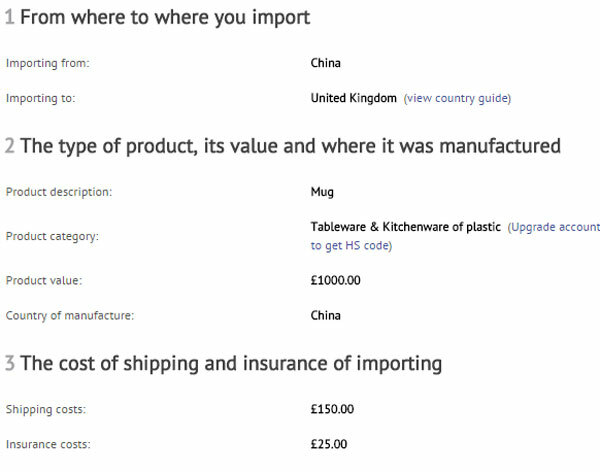 I was thinking Andrew if you import something from China and the seller is offering free shipping, what would happen with the customs charges seeing that vat is charged on the items cost, shipping and insurance. Obviously the shipping isn’t really free the seller has just incorporated it in to the cost of the product/s. So would you have to pay vat on the shipping cost that the supplier has paid for or is the shipping cost not included in the customs fees? I think then they just assume that shipping is 0 and you don’t pay VAT on 0 obviously. It doesn’t really make any difference as it’s same VAT rate for product price and shipping. But with free shipping you do actually lose out as import duty is calculated on product’s price! if it includes shipping, this means you’re over-paying import duty. Thanks for this post. Lot of information.Ii have a small doubt. Importer pays the duty+VAT but when the customers purchases the item, they normally the VAT too. So is the VAT charged twice on the same item? No. If you’re NOT VAT registered, you don’t charge VAT on your end sales to customers (you can’t do it). If you’re VAT registered, you’ll pay government the DIFFERENCE of VAT your customer pays and amount you paid @ importing stage. So there is no double VAT charge/payment. I have been a member of eBay since 2004, and a few years back I upgraded to business seller, with the intention of building an eBay business, but somehow it never happened. I had over 100 feedback, mostly as a buyer, having sold the odd personal items here and there. A few weeks ago I came across your excellent blog and I purchased your Easy Auction Business, which Is probably one of the best investments that I ever made. It was the motivation I needed to get going. 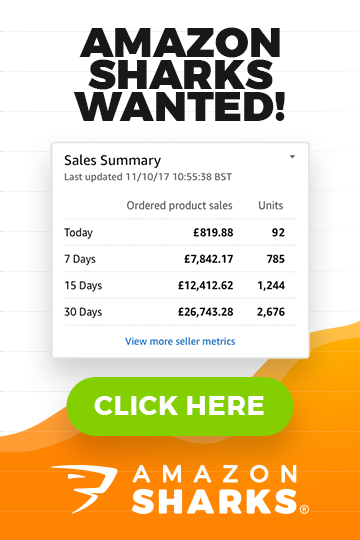 I followed your advice to the letter, and in 3 weeks, through buying blu-ray bundles and 3 PS4’s I achieved 110 transactions, £1350.00 of sales and 5/5 on all areas with no defects, up to 31st of January. Hopefully I will get the coveted TRS by the 20th of this month. It was a lot of work, listing all the items, ( originally I bought 185 blu-Ray’s in total, and only 22 left now). I worked out that the total exercise cost me around £225.00 which is very much in line with your predictions on one of your blogs. So it can be done in under a month. That’s my story so far, and having achieved that, now my research process has started. I’m looking at ladies/kids clothing/shoes/handbags (not for the kids!!) as a possible area to get involved in. I would like to take the 3 routes, ie. eBay, Amazon and eventually my own website, offering own branded goods. My background is sales and marketing so that will be the natural route for me to follow. Here’s my question: I understand that Portugal are a very good place to import those items from, probably not as cheap as importing them from China, but I’m told that they have very high quality at a very reasonable price. Being an EU country, simplifies things a lot to start with, and once I have some experience under my belt, I could then venture into importing from China. Do you think this is a good strategy and do you have any experience at buying from Portugal? Your thoughts would be much appreciated, and please keep up your excellent work. Many Thanks for your EAB purchase & for sharing your progress so far! Very impressive, congrats! Yes, working with EU based suppliers can be actually very lucrative as shipping is cheap/fast and you don’t have to pay import duty either. I can’t see any fault with your strategy as long as you find supplier that offers products you want at decent price. I have fallen foul to import tax calculation, even though I thought I was fully aware of how to calculate it all (having made 2-3 LCL imports before). I was in the middle of writing this comment before reading the full article, then noticed on of your examples of a mug so is VERY pertinent. I only found this out on arrival at port in the UK by Woodlands Global, and they weren’t really aware of it either until we probed. It shows, not knowing what you need to know is a big problem – how would I know to search for anti-dumping duty on ceramics without knowing it existed in the first place! In this case it wasn’t the end of the world, the product was still profitable, but now I need to make sure certification is in place. Thanks for sharing this with us Paul, very true! Hi Andy, thanks for the interesting article, this has made me think, with this referendum taking place if the UK decides to leave the EU do you think that UK will have to setup trade negotiations with thre EU regarding taxes on imports? As I assume we currently pay no duty like you say in the EU due to the UK being a member of the EU. And also do you think that this will also force negotiations with other Non-EU countries on imports considering the EU won’t have influence. Yes, probably that’s what would happen – we’ll have to start paying import duty again from EU countries. But it depends on the exit strategy really, what agreements will be put in place etc. etc. This is an excellent post. Taking into account all costs correctly is absolutely crucial. You can see whether a product will make you money or not and if yes, how much. I created an excel spreadsheet and calculated my costs backwards so to speak. I entered my target selling price on ebay, deducted ebay, paypal, P&P costs to myself in the top half of the table. In the bottom half I entered prices quoted by suppliers of all the components that make my final product (in USD), freight, import duties &VAT. Another row transforms the total in USD to GBP at a very bad rate to myself and finally 2 more rows with the profit before tax and ROI/ item. There are formulas throughout the tabel that allow me to change any of the amounts and totals are updated automatically. Like this I see where I can potentially cut any costs to make a difference. The advantage of having a spreadsheet like this is that I can just add another column for a new product and by imputing basic numbers I can quickly see if it’s worthwhile importing or not. Andrew, my question is this: is this something you do yourself or do you have a better solution to an excel spreadsheet? Yes, I also use a spreadsheet – on Google Sheets. There’s no need to complicate this process.